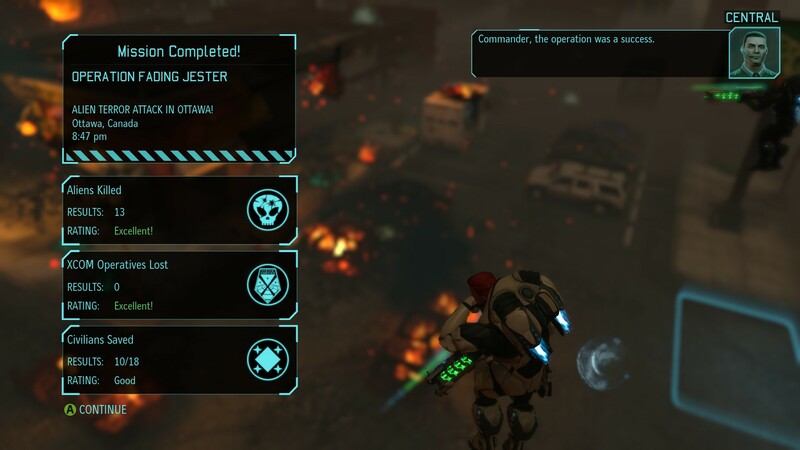 The battle of Melbourne, June 2015, dealt a bitter blow to XCOM. 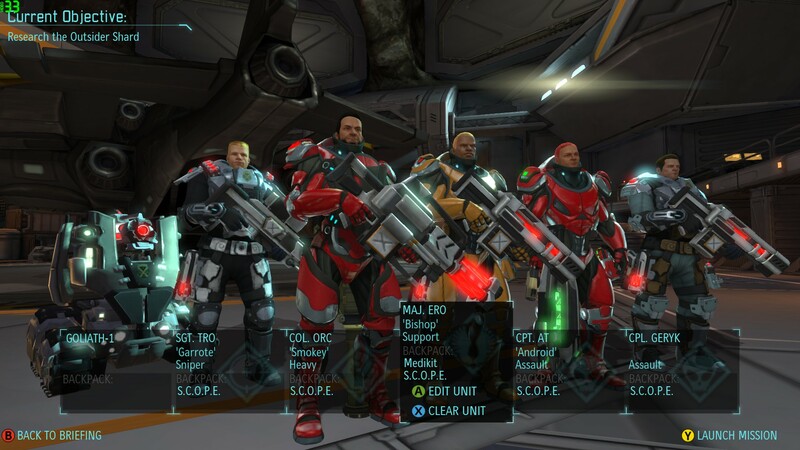 It left us down two countries and five soldiers (four of them amongst our finest veterans), and painfully exposed the inadequacies of XCOM equipment against the aliens’ latest toys. The laser weapons and carapace body armour that had served us so well, just a month or two ago, now look like a joke against Cyberdiscs. The new faces joining the squad are under-levelled marksmen of dubious skill. 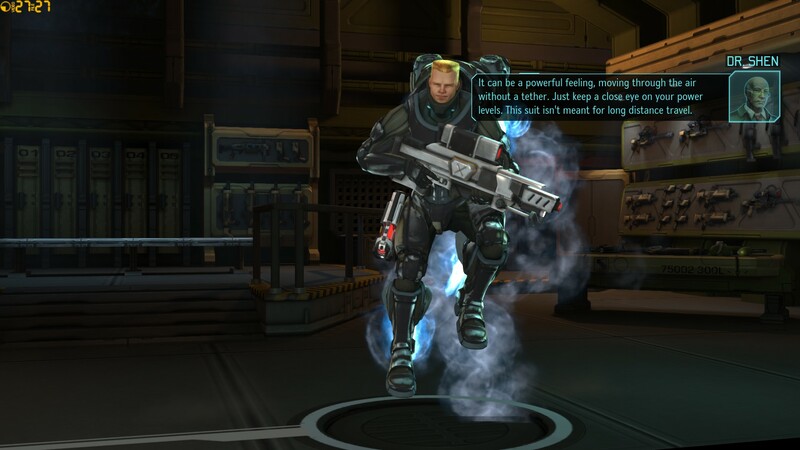 But XCOM is a game about fighting back against the odds. This update is the story of how my survivors – a lopsided bunch, with too many snipers and too few heavies and support troopers – make do. Cash: Lots and lots, but by now this is no longer the main obstacle. The game’s economy runs on 3.5 inputs – the main three being cash (scarcest, and most important, at the beginning), alien alloys (only obtainable as loot; used for researching and building mid- and top-tier items), and Elerium (ditto; used for top-tier items). 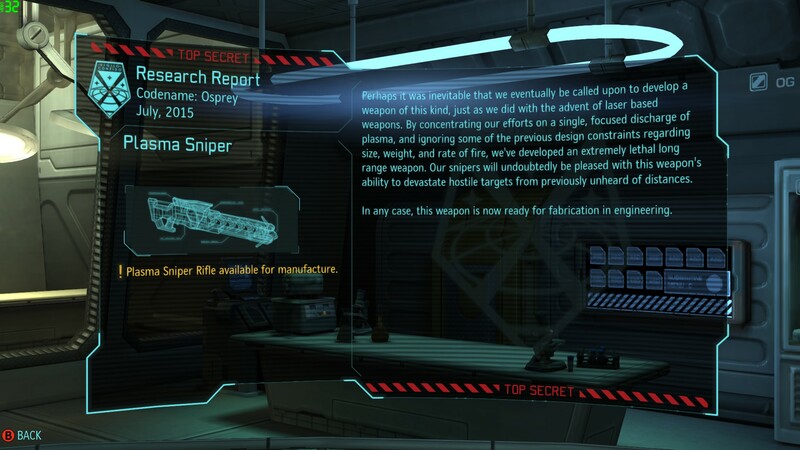 The half-input is alien weapon fragments, which are also only obtainable as loot; however, they are ridiculously abundant, and are only used for research, not production. During this update, alloys and, to a lesser extent, cash are my main bottlenecks. Heavies: One (experienced – Major Talorc). Support: Two (one experienced – Captain Thasero; one novice – Squaddie 2K Alan). Assault: Three (two experienced – Captain Rebecca W and Lieutenant Kat; one novice – Squaddie Bruce Geryk). Snipers: FOUR (two experienced – Captain Elyscape and Corporal Riztro; two novices – Squaddies Gunner and Swordlily). Top-tier suits of armour: Zero. After the Melbourne disaster I’m very keen on keeping my surviving troops alive, but Dr Vahlen is still some ways off titan armour (the strongest in the game), and even further from archangel armour (a titan spin-off which trades off a little durability in exchange for a jetpack). Top-tier weapons: Zero. 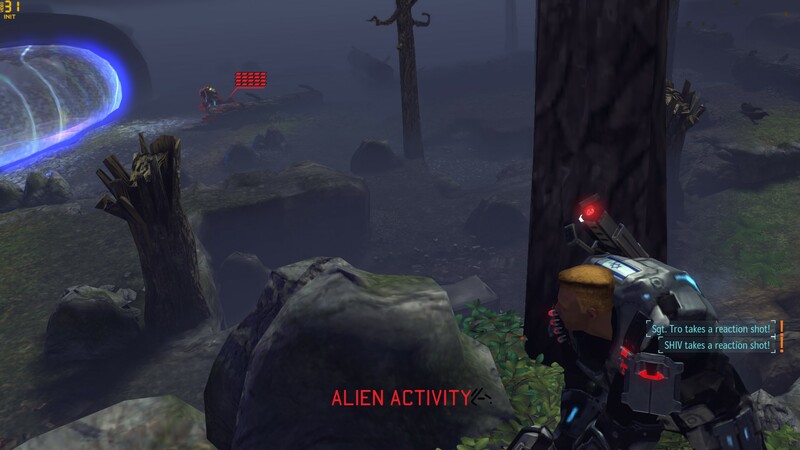 While the previous month, my squad finally recovered some of the aliens’ plasma weapons, researching them would take a long time (capturing and interrogating a Muton would grant a bonus, but I haven’t succeeded in nabbing one yet). As such, for now I might as well knock off armour and come back to weapons later. On the 10th of July, I finish building the Foundry, which unlocks a host of unflashy-but-important upgrades (such as improved ammo capacity and better medikits); however, before I can finish that research, it’s time for the next battle. A “large” UFO, an Abductor, has landed in Brazil. 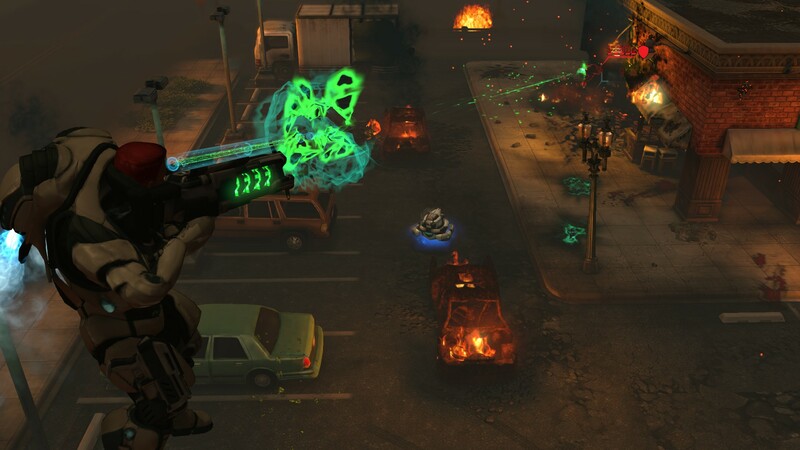 It’s up to XCOM to thwart the aliens’ plans. 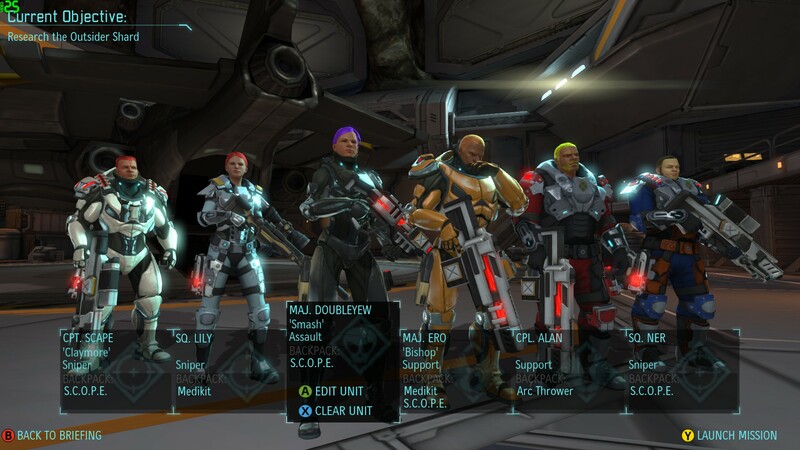 I have to start levelling up my newbies sometime, so meet Squaddies Bruce Geryk (Assault), 2K Alan (Support), and Captain Elyscape (Sniper – in his first mission since joining XCOM after the Glasgow battle last month). In the end, the mission is aptly named. 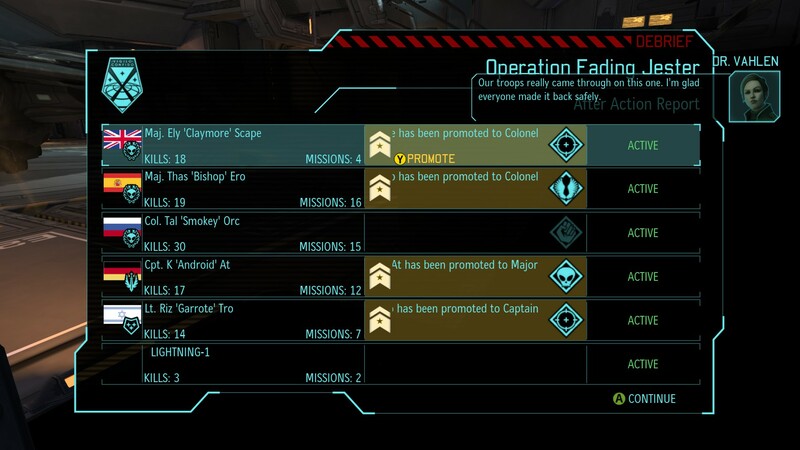 XCOM doesn’t suffer a single fatality, Elyscape is only lightly injured, and Talorc becomes XCOM’s first colonel! 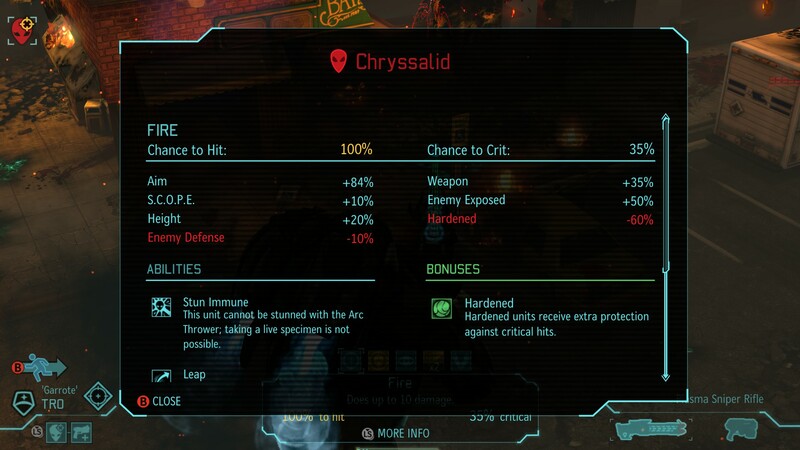 Special mention, however, goes to the two captives we’ve brought home – the Muton, and an Outsider shard (all that’s left of the Outsider that was stunned). Interrogating the Muton, which is instantaneous now that I have complete satellite coverage of South America, will grant me a much-needed boost to plasma weapons research; meanwhile, studying the Outsider shard will let me progress the game’s plot. However, the next battle comes before I can unlock any new toys. Number of soldiers with top-tier armour: Zero. Number of soldiers with top-tier weapons: Zero. 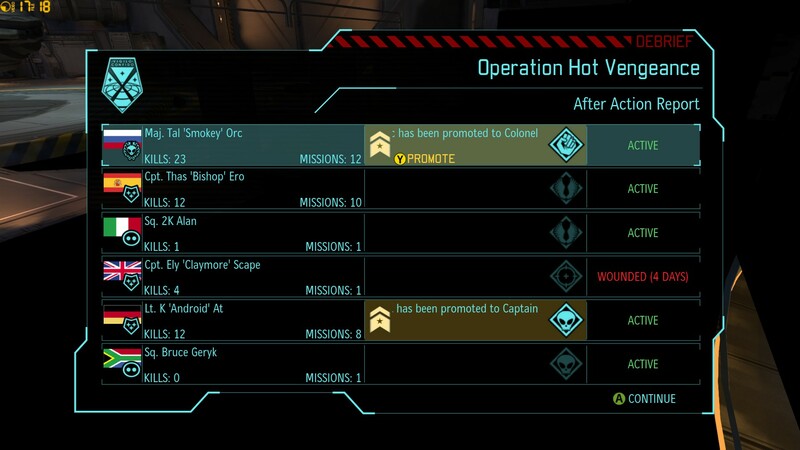 Number of XCOM deaths: Zero. Sorry, no squad screenshot this time! Suffice it to say I bring four of the same guys (Talorc, Kat, Bruce Geryk, and Thasero) with the same gear, plus two junior snipers, Riztro and Gunner. 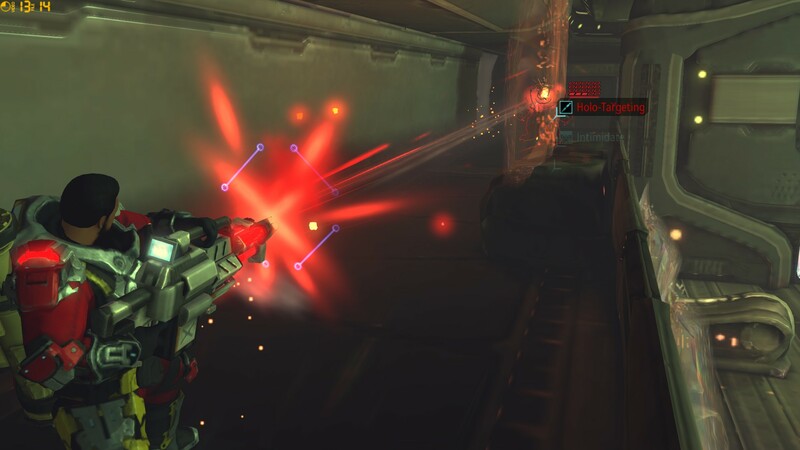 At least this time, everyone has a laser. 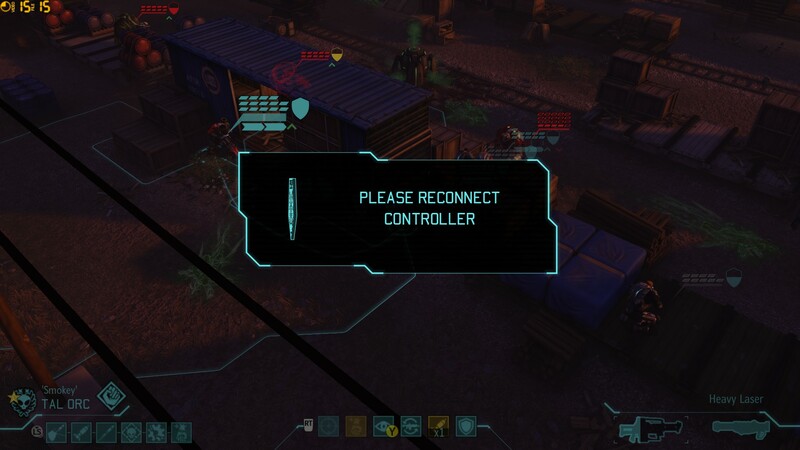 That was a game freeze, caused by its demand that I reconnect a controller that was already plugged in! I end up closing the game with Ctrl-Alt-Del, and when I reload from the autosave, that gives me the chance to redo that turn. And that research finished right in the nick of time. The very next day, our satellites pick up a UFO – a large scout – over China. Our laser-armed interceptor scrambles, and pleasingly, rips the UFO apart with minimal damage to itself. Unfortunately, our next item of research – plasma rifles – is still some time off, so we’ll have to do the next mission with just lasers. 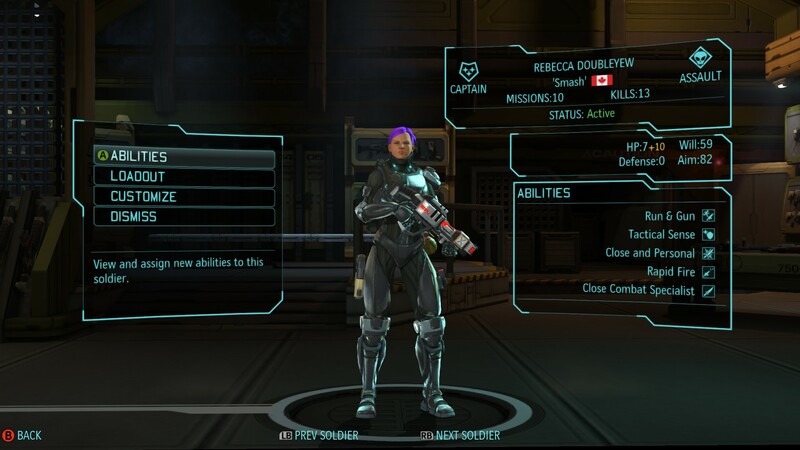 Number of soldiers with top-tier armour: One (Rebecca in titan). 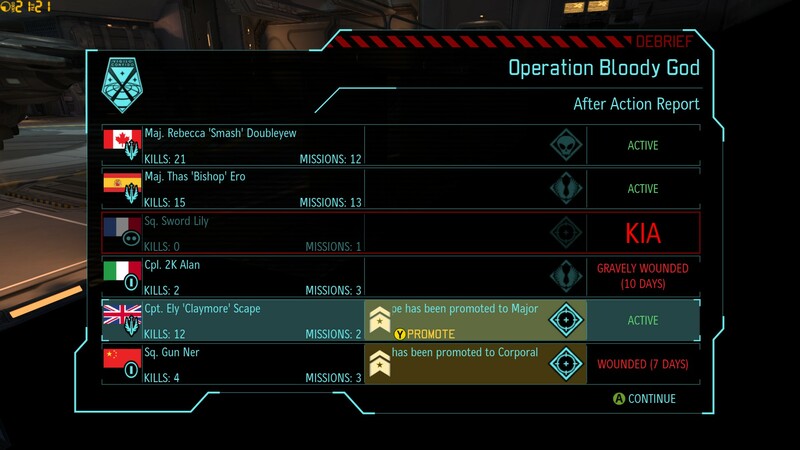 Number of XCOM deaths: One. And this battle is what happens when the luck runs out. Another new face joins the squad – heavy weapons specialist Calistas. The rest of the squad comprises Thasero, Riztro, Rebecca, and the laser-less 2K Alan. 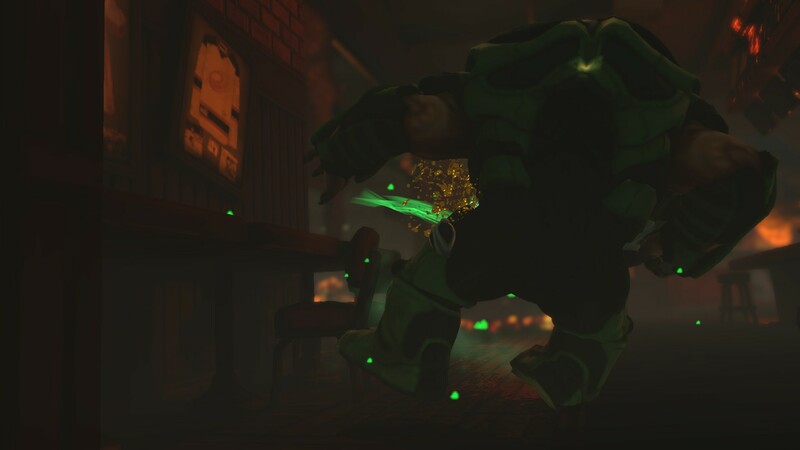 Bruce runs, but can’t get out of the Berserker’s sight. Next turn, the aliens roll forward. 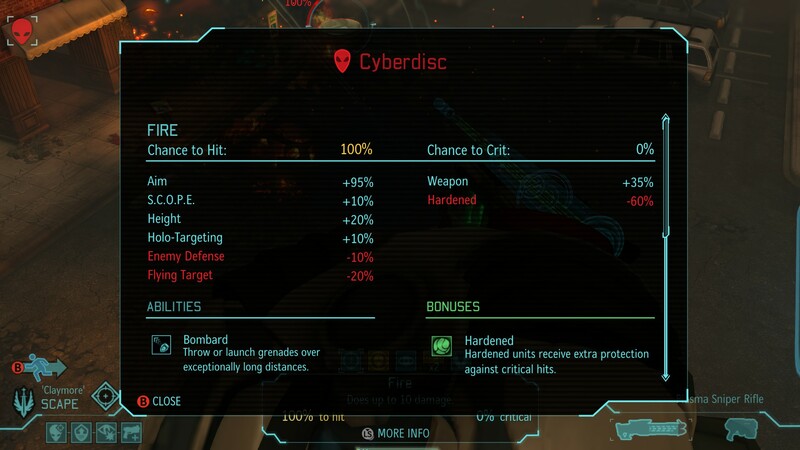 The Cyberdisc blunders into Rebecca’s “Close Combat Specialist” radius and ends up as a pile of fragments, but that leaves the Muton and the Berserker. 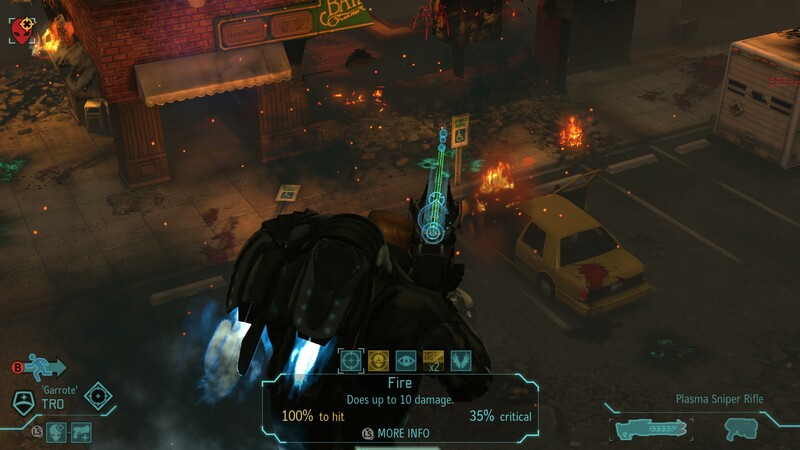 A grenade from the Muton injures Calistas and Rebecca, and then the Berserker vaults a log and reaches for Bruce with arms like tree trunks. I wince. But Bruce survives with a single point of health. Next turn, Bruce runs all the way around a hill to hide. Various soldiers plink away at the Berserker, wounding it, and Thasero buys a bit of time by using the last of his ammo to suppress the Berserker. 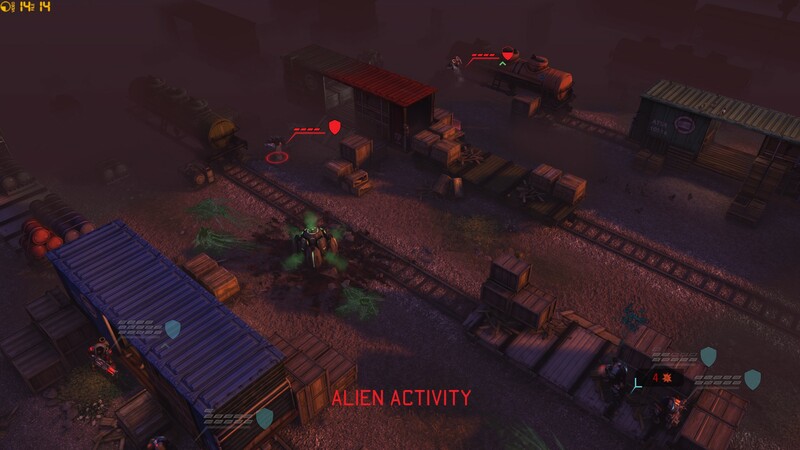 But then on the aliens’ turn, the Muton shoots the wounded Calistas dead. 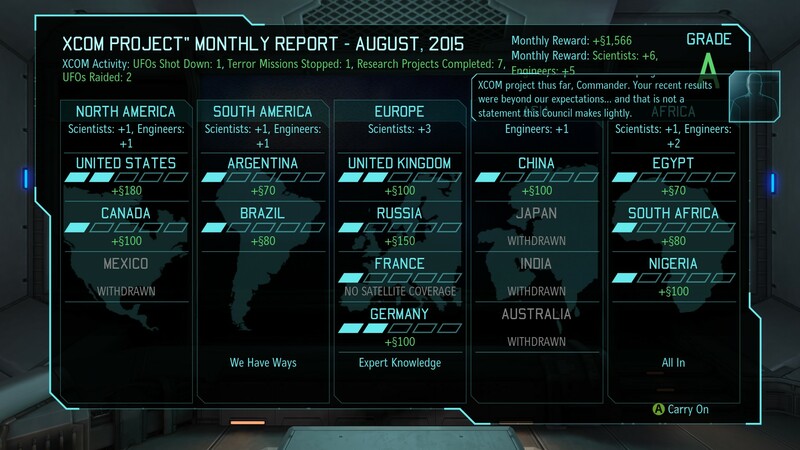 It’s not looking good for XCOM. 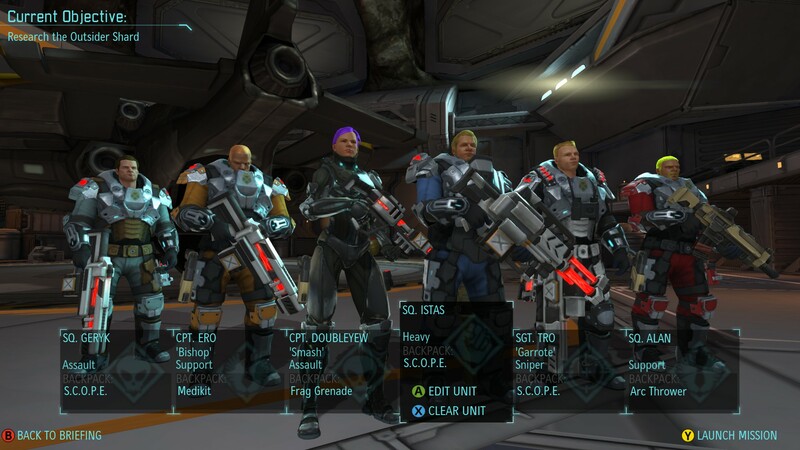 A Berserker is in the middle of the squad, the Muton not far away. One man is dead. 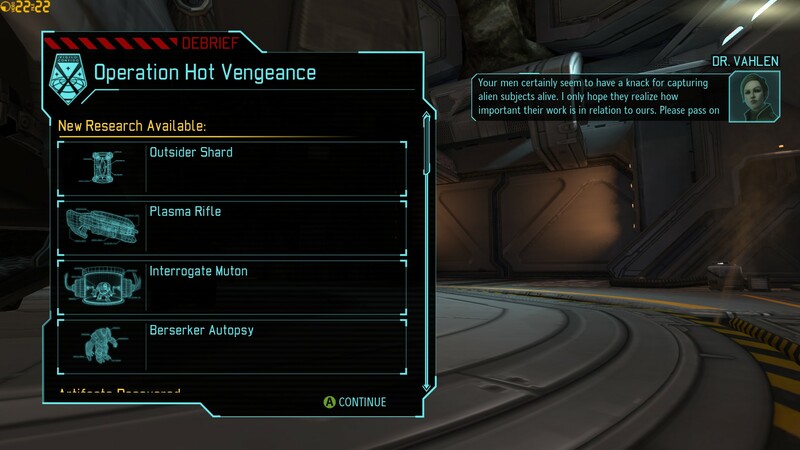 2K Alan’s assault rifle is of dubious use. Thasero is out of ammo. Bruce is hiding on the far side of the hill. Effectively, Riztro and Rebecca W are our last hope. … and kills the Berserker with a critical. 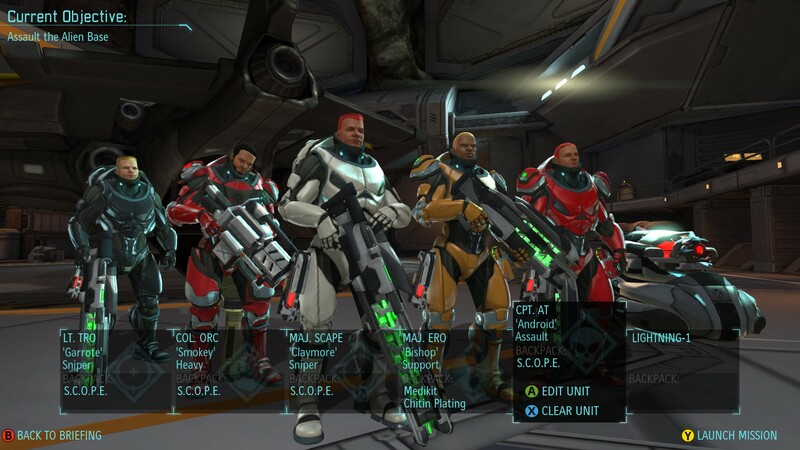 The Muton retreats, and in the breathing space that follows, everyone reloads their weapons while Thasero patches up their wounds. Grimly, I order the squad to press on. 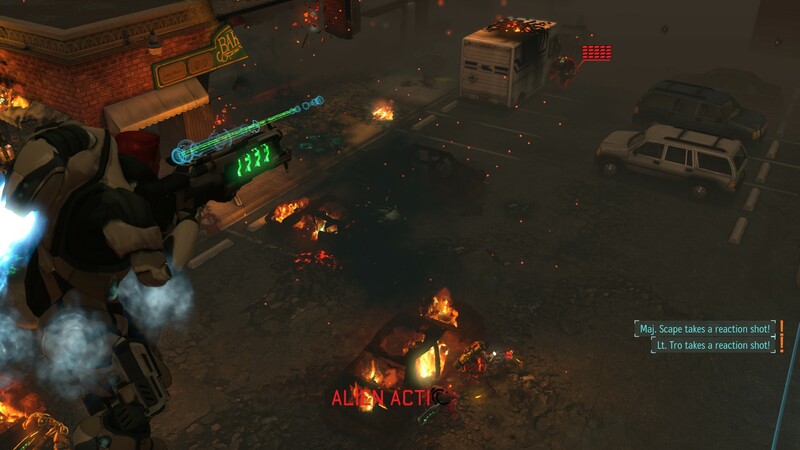 Luckily there are only a handful of aliens left, and most of them easy (the Muton – who isn’t nearly so tough when caught in the open by himself – two Thin Men, and the UFO’s Outsider captain). 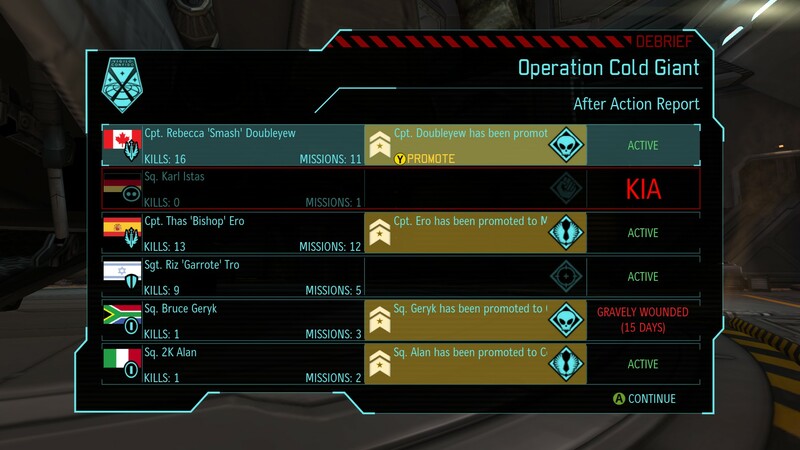 Much of the squad is now in hospital, but the war grinds on. The very next day, the Council phones us with a new mission: safely retrieve a woman who’s escaped from alien abductors. Number of soldiers with top-tier armour: Three (Rebecca, Thasero, and Elyscape in titan). 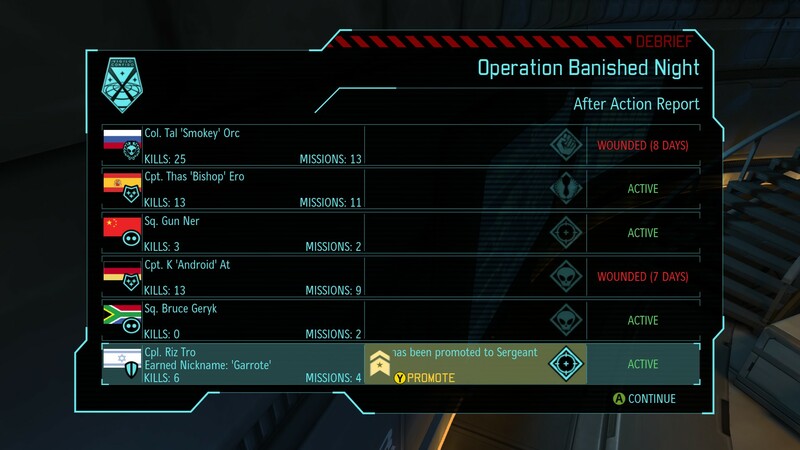 Note the lopsided squad selection – with two out of my three Assault soldiers and my only Heavy in hospital, I’m forced to bring along no fewer than three snipers. One is the formidable Captain Elyscape, but two (Gunner and fresh face Swordlily) are still novices. At least 2K Alan gets to hold a laser rifle for the first time. My squad starts off to the bottom left, and Anna Sing, the person we’ve been sent to fetch, is in the top-right.. The good news: the aliens are all Thin Men. The bad news: they make up for in quantity what they lack in quality. Not a lot of dramatic set-pieces here, just a grind through wave after wave of Thin Men. Notably, this is the first battle in which snipers show their true potential. 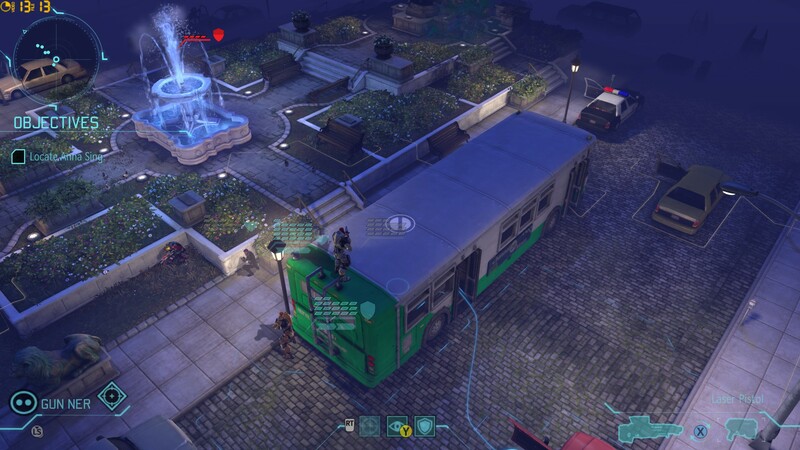 Normally I have difficulty finding suitable vantage points for them (not helped by my skipping over skeleton armour, which contains a grappling hook); this time, I perch Elyscape atop the bus, allowing him to shoot across the map. He accounts for almost half the total kills in this battle (8 out of 17) by himself! In the end, the butcher’s bill does double duty as an advertisement for titan armour. 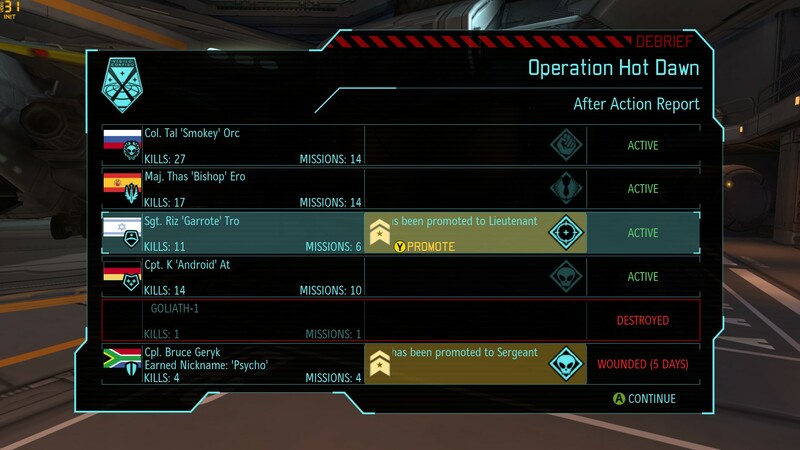 Not one of my titan-armoured veterans was killed or hospitalised! Meanwhile, out of the three carapace-armoured novices, Gunner was wounded, 2K Alan was critically wounded when an arc thrower banzai charge finally went awry, and Swordlily, sadly, perished. The lesson is clear. Better gear pays off. 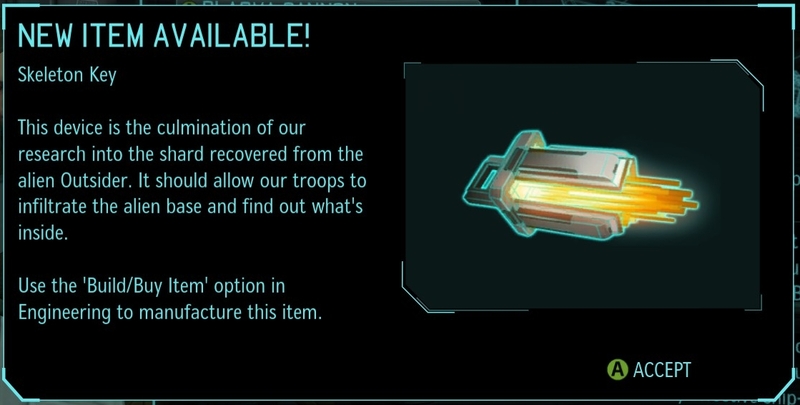 In an ideal world, I’d be able to equip the squad with captured, surplus plasma weapons. As is, I build a single plasma rifle – all I can afford. 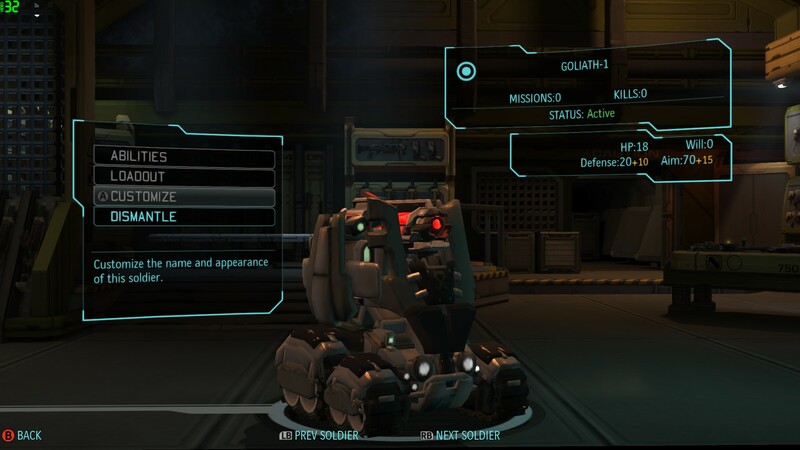 Say hello to Goliath-1 – an upgraded version of the SHIV, the robotic mini-tank XCOM can deploy once it builds the Foundry. With a laser cannon, suppression fire, and alloy armour that confers 18 health (as much as a titan-armoured soldier), I can’t wait to see it in action. Even fancier SHIVs are in the pipeline. On 6 August, Dr Vahlen completes research on a new fighter aircraft, which will also allow me to produce a hover-capable SHIV. Number of soldiers with top-tier armour: Three (Kat, Thasero, and Elyscape in titan). 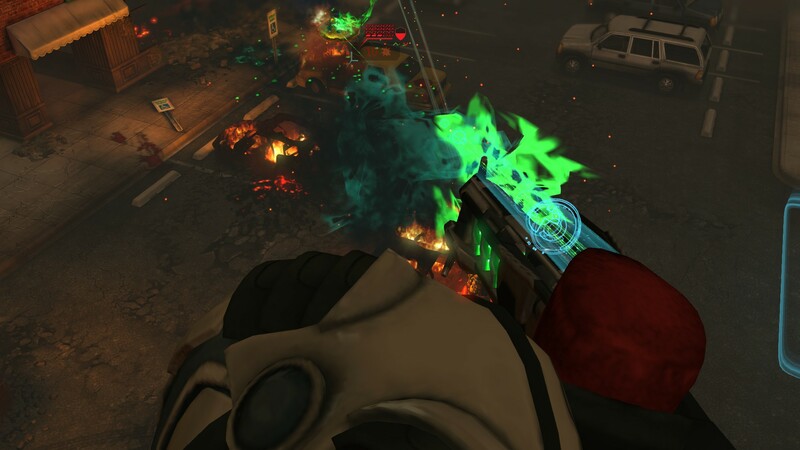 Number of soldiers with top-tier weapons: One (Kat’s plasma rifle). 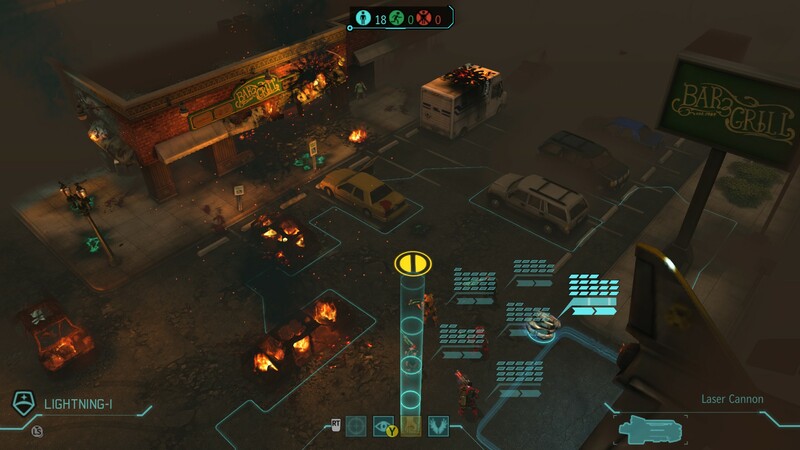 Number of XCOM deaths: Zero, though Goliath-1 is destroyed. 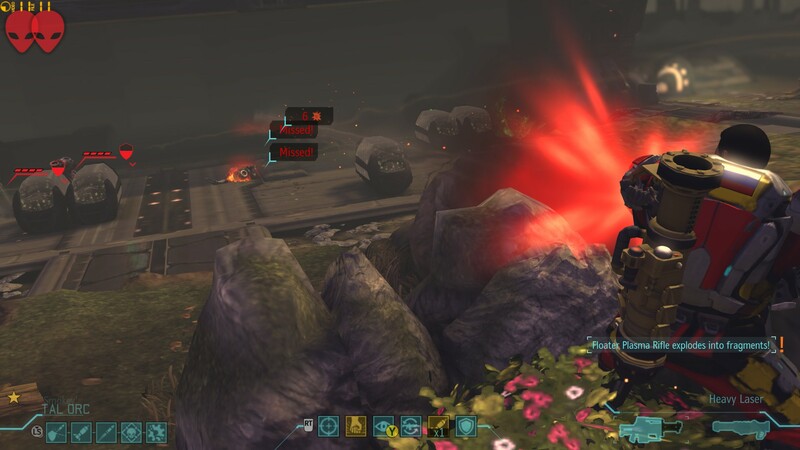 Even though the SHIV doesn’t survive the mission, my new toys are a success! The squad lands on a hill overlooking the UFO, and the opposition – a Cyberdisc, Mutons/Berserkers, and a new breed of alien, the Heavy Floater – is not far from the foot of the hill. However, high ground, careful play, and Kat’s plasma fire all pay off, and the SHIV takes a remarkable pounding before finally going to the great foundry in the sky. 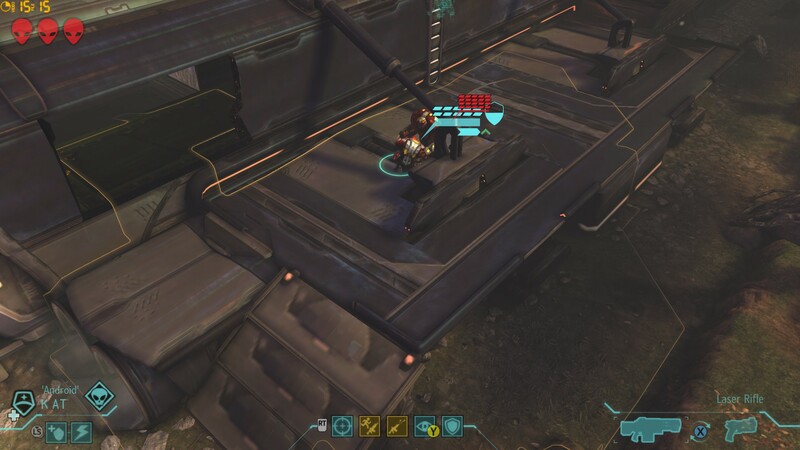 Following the mission, I promptly start construction of a hover SHIV. I can’t think of a better scout – mobile, heavily armoured, and hard to hit – and just as robots in real life are used for jobs that are “dirty, dangerous, or dull”, I’d rather risk a SHIV on point than one of my precious soldiers. As a backup, I order two plain vanilla SHIVs – while obsolete by now, they are also dirt cheap and better than nothing if I ever suffer a catastrophic loss. A few days later, on 15 August, research completes on archangel armour! 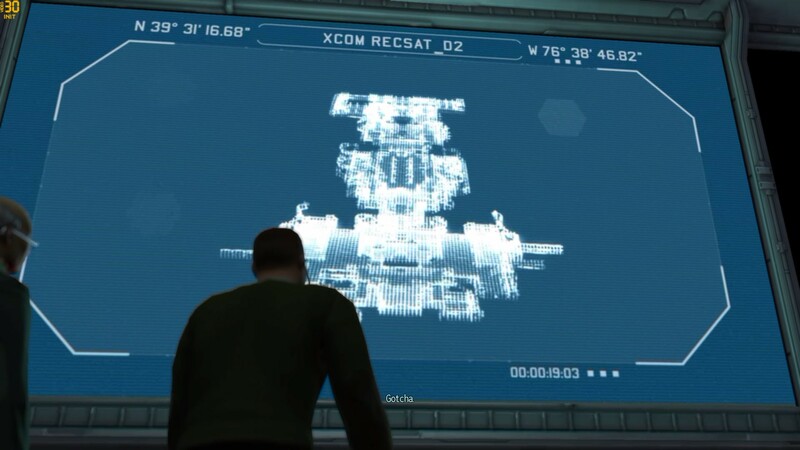 I hold off the base assault for now, though, and on 21 August, another “large” UFO appears – this one a supply ship. 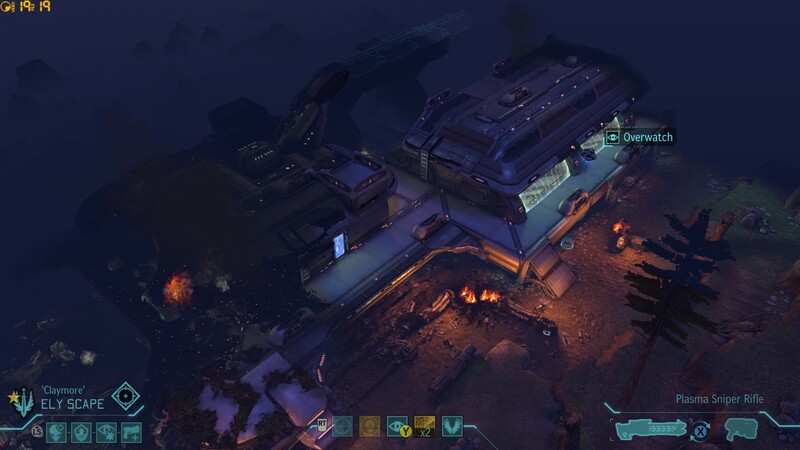 My interceptor fights a long, tough battle, but at the end, the UFO is a smoking ruin. What wealth of loot might I find in its hull? Number of soldiers with top-tier armour: Five (Kat, Thasero, Kylie Istas, and Bruce Geryk in titan; Elyscape in archangel). 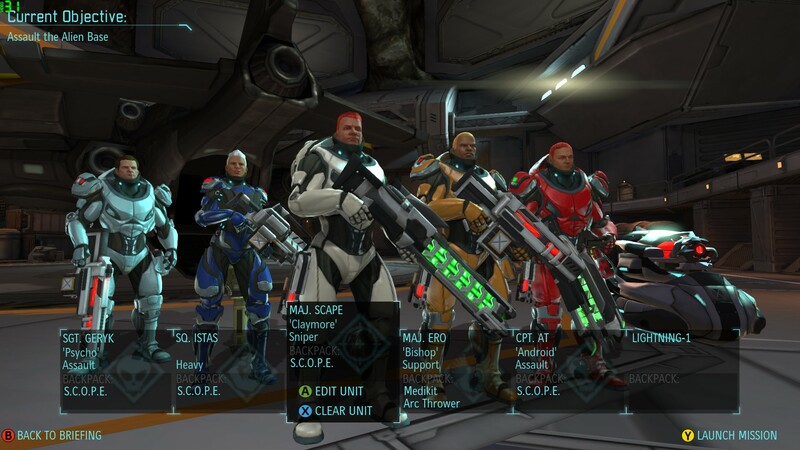 Number of soldiers with top-tier weapons: Two (Kat’s plasma rifle; Elyscape’s plasma sniper rifle). 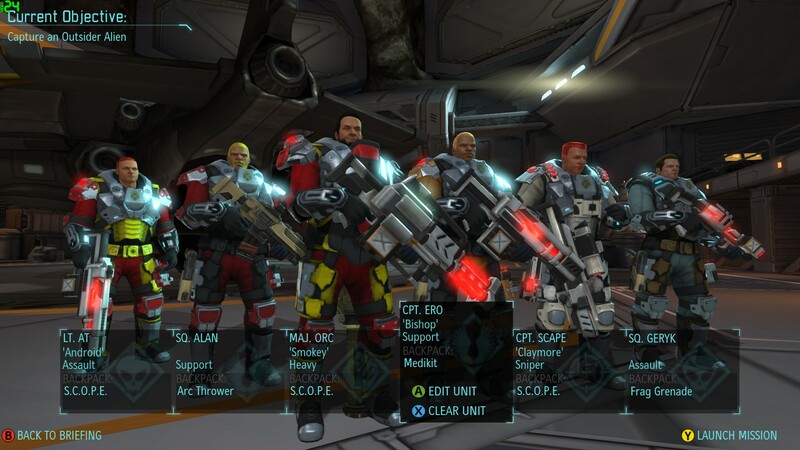 For this mission, I bring our first archangel armour, our first plasma sniper rifle, and another new soldier – Kylie Istas, who joined XCOM in hopes of avenging her twin brother Calistas. In the end, both the archangel armour and the SHIV’s hover capabilities are wasted – the aliens prudently remain in and around the supply ship, meaning I have to go inside to winkle them out. Again, not a lot to say about this mission. My squad bursts into the bottom-left room and guns down its Floater occupants. When a pack of Heavy Floaters comes by, I defeat them by retreating inside the room and camping the entrances. 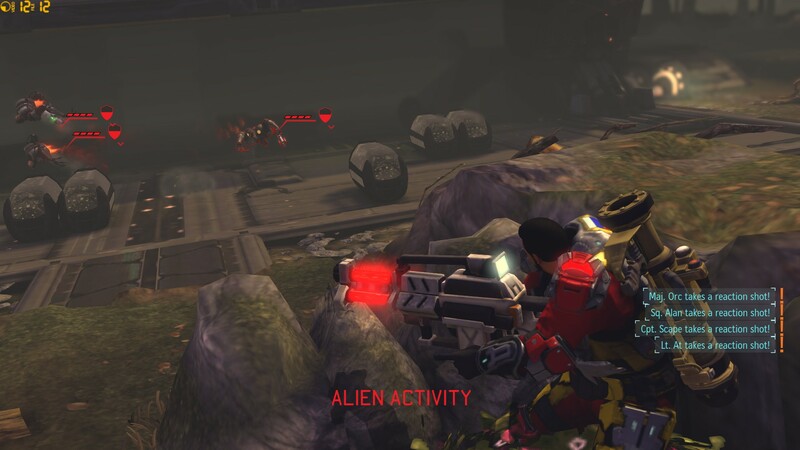 Heavy or not, the aliens don’t survive their attempt to waltz past doorways guarded by an entire XCOM squad. The Outsider captain (in the cargo bay), and two Mutons (in the top-right area), are easy to deal with. The loot lives up to my hopes, and I’m prepared when the aliens launch a terror attack on Ottawa a few days later. 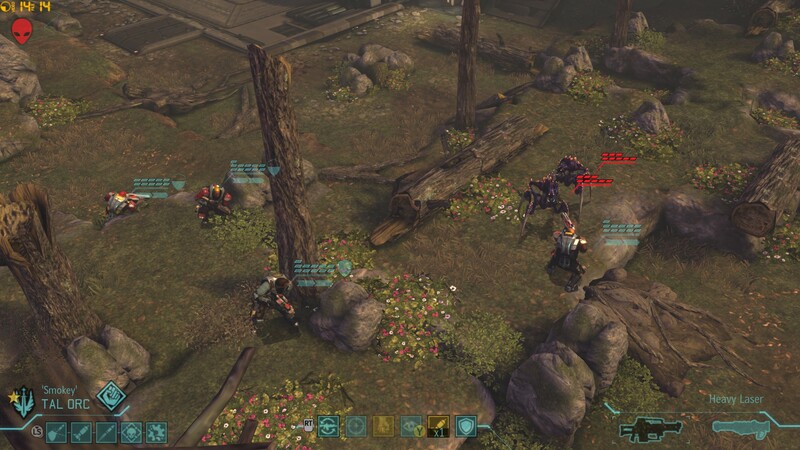 Number of soldiers with top-tier armour: Five (Kat, Thasero, and Talorc in titan; Elyscape and Riztro in archangel), plus one spare suit of titan back at base. Number of soldiers with top-tier weapons: Four (everyone except Talorc). 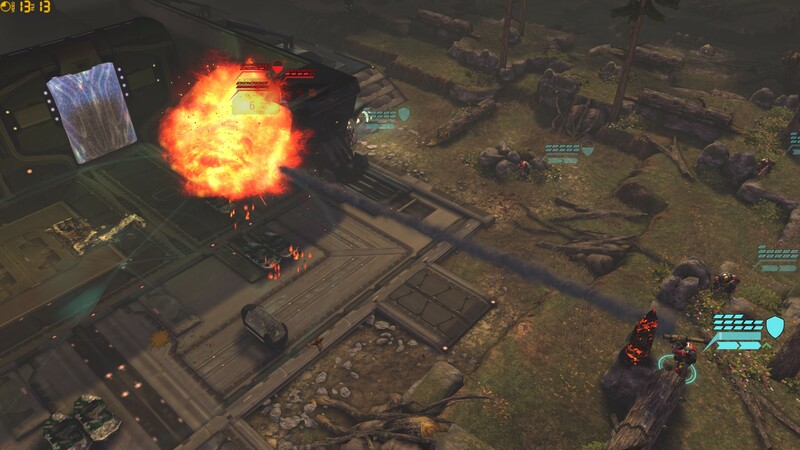 The two snipers lift off, taking up position above the corner of the map. 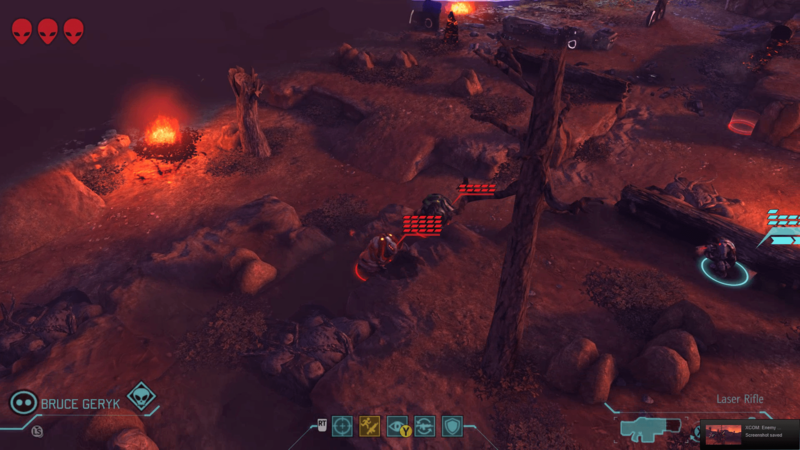 Everyone else pushes forward for a better view; the SHIV goes farthest towards the building, while Talorc, Thasero and Kat crouch behind burned-out cars. I end my turn. And the killing begins. And Elyscape doesn’t even have his Colonel-level skills (In the Zone/Double Tap) yet! At the end of the month, the Council is delighted, and so am I. Finally, the ghosts of Melbourne have been avenged. KIA in this instalment: Squaddie Calistas (Heavy), Squaddie Swordlily (Sniper).